When cooking meat the only way to achieve "fall off the bone" tenderness is to cook low and slow. However, most individuals do not have the time to commit to standing over a BQQ pit for 8 hours. In an attempt to alleviate this barrier this recipe uses a wet rub that is massaged onto the chicken before being cooked in a crockpot. If you do not want to make the wet rub you can use any seasoning blend of your choice. McCormick's and Mrs. Dash both have great seasoning blends that can be used instead. When you are traveling try finding local seasoning blends. Incorporating flavors associated with found memories is a great way to reminisce about a trip or vacation. 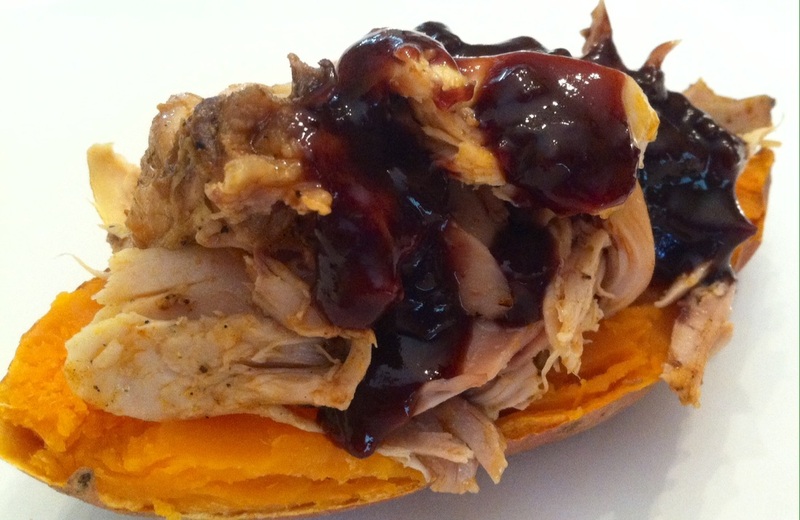 To decrease simple carbohydrates and increase nutrient intake top a baked sweet potato with the pulled chicken instead of a bun. The sweetness of root vegetable complements the tanginess of the seasoning and is loaded with beta-carotene and fiber. When eating animal products it is important to remember they do not offer antioxidant protection and should be eaten along side whole plant foods that do. For more flavor add a BBQ sauce that does not have high fructose corn syrup. This may be difficult to find as most of the name brands contain this modified sugar. Here is another opportunity to find a local product. The grass roots of BBQ is still spirited despite all of the food industry's commercialism. Many parts of the country take much pride in their special BBQ recipes and I encourage you to try some of these unique flavor fusions. When reviewing the nutrition facts keep in mind not all of the rub is required to marinate the chicken and may not be entirely accurate. If you are looking to decrease your calorie intake I would suggest using skinless chicken breast instead of the entire chicken as this recipe does. Modify this recipe to meet your specific nutritional needs, either way the end product will be a delicious meal high in protein, iron, B vitamins and flavor. Directions: In a medium mixing bowl mix together all the ingredients together excluding the chicken. Have the slow cooker ready and set in front of you. Generously massage the wet rub on the chicken and place in the Crockpot. If you are going to use a pre-made seasoning blend rub the meat generously with the chosen flavorings and follow the remaining directions. Add the stock and turn the slow cooker on low. Allow to cook for at least 6 hours. When complete remove the chicken from the bone and serve on a sweet potato with BBQ sauce (without high fructose corn syrup).